Last week I posted chapter 21 of Journey Through Twin Peaks - "7 Facts About Twin Peaks: Fire Walk With Me" - because I wanted it to go up before New Year's. To do so I had to skip a chapter, but with this video (the introduction to Part 4 of the video series) we're all caught up. I will probably not post again until I'm either done with the project or one last chapter remains. I'm expecting four more videos in the series. The first focuses on the FBI, Cooper, and the Teresa Banks investigation. The second explores Lynch's extension of the Twin Peaks mythology in Fire Walk With Me (including, hopefully, connections to the Rig Veda and Upanishads, which I am reading now). The third, which will probably be the longest chapter of the series, covers the last seven days of Laura Palmer and, finally, her death: a grim premise transformed - perhaps - into a spiritual climax (this may require a separate fourth chapter; we'll see). And then the final chapter traces the legacy of Twin Peaks mostly through the subsequent additions (Log Lady intros, Missing Pieces, Between Two Worlds, etc.) and feature films of David Lynch. 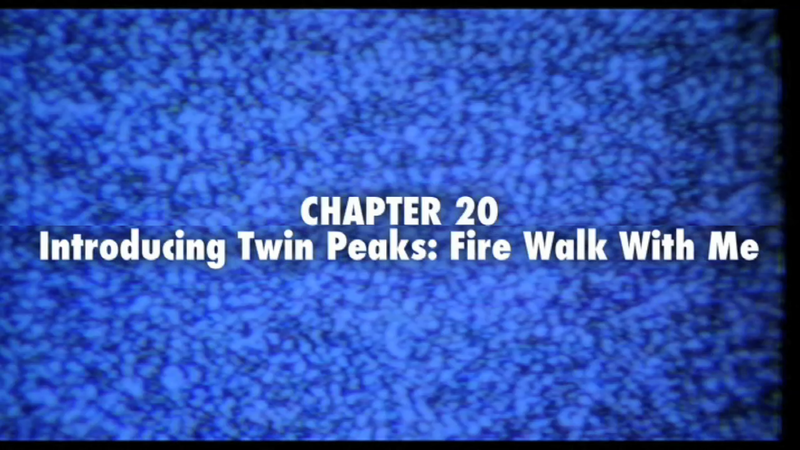 For now, you can watch Chapter 20: "Introducing Twin Peaks: Fire Walk With Me" which sets up the themes (particularly through the title montage) that will be explored in the upcoming chapters, especially the Laura one.